I'm definitely not what you would call a coffee person. I tried drinking it for a semester in college but I was putting so much stuff in it to make it drinkable that it pretty much defeated the purpose. Then a year ago while leaving a favorite drink establishment, one of the employees offered me a caramel mocha that was a duplicate for an already filled order. I took it to be polite figuring that once I walked out, I could pawn it off on my coffee loving husband to drink. But the whipped cream cloud on top drizzled with caramel seduced me into taking a sip. And I was a goner. It turns out that I'm totally fine with mochas as mocha = chocolate! With the weather becoming warm, I've been treating myself to several iced mochas but I wanted something that I could enjoy at home. These popsicles are the answer! 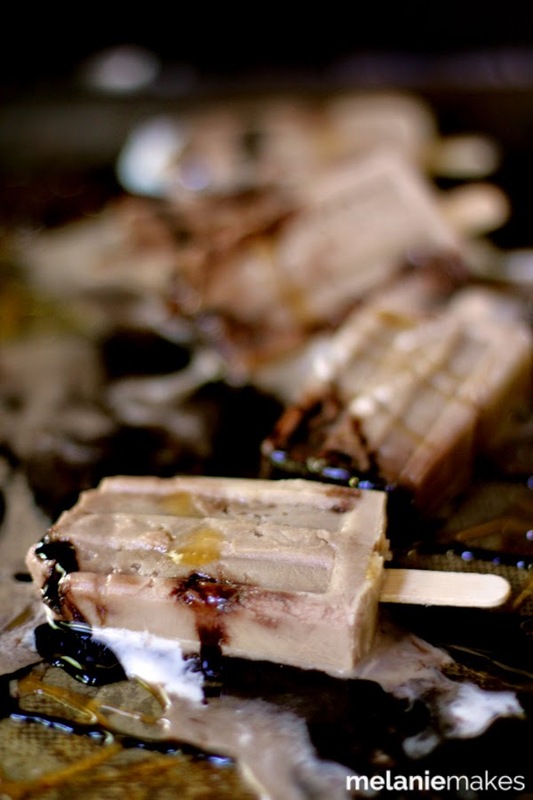 A mocha popsicle flavored with caramel and chocolate syrups, caramel creamer and whipped topping. Even better? One recipe makes enough popsicles to create a stash in my freezer, ready at a moments notice. In a large mixing bowl with spout, stir together all ingredients. 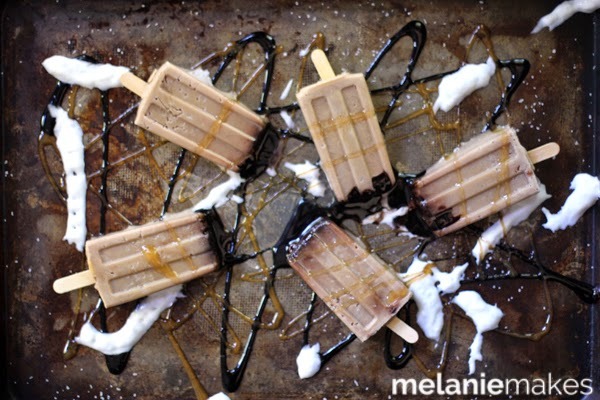 Drizzle chocolate and caramel syrups around edges of popsicle molds. 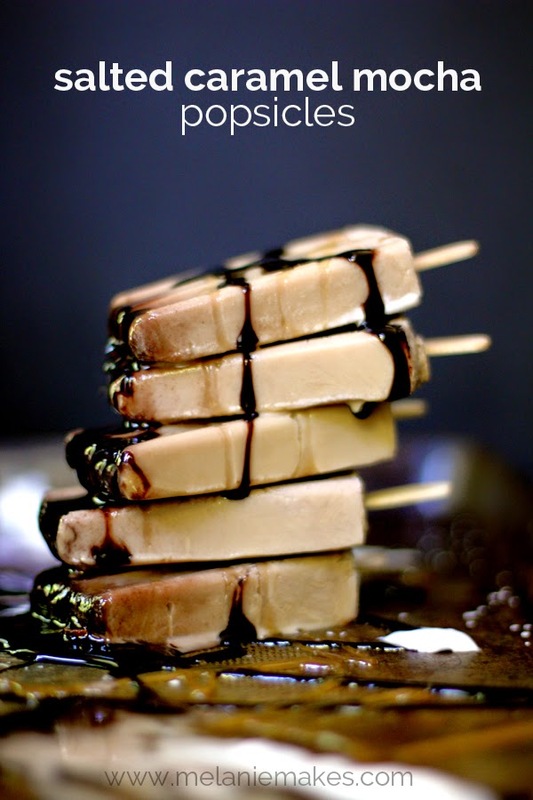 Fill each popsicle mold with coffee mixture and insert popsicle sticks. Want to pack a flavorful punch to your popsicles? I chose to use mocha flavored coffee and caramel flavored creamer in this recipe. You can find Melanie online at Melanie Makes where she works to make everyday eats a little more interesting. 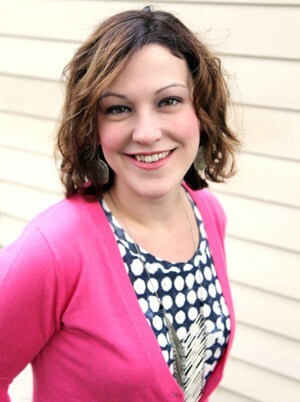 Melanie lives in Cleveland, OH, with her husband, three children, puppy, two cats and Lizzie, the 15 year old turtle. You can also find Melanie Makes on Twitter, Instagram, Facebook and Pinterest.